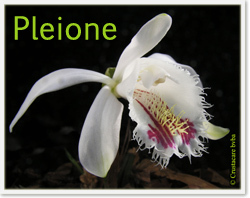 Albiflora.be - home - Albiflora is a division of Crustacare, specialised in orchids. Welcome to the Albiflora - Crustacare special plant and orchid site. The new season 2018- 2019 has started ! We resume plant shipping again with wild PEONIES this month. 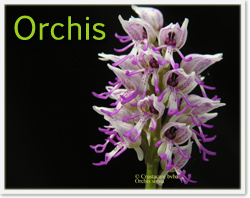 Our new lists of ORCHIDS for fall/spring 2018/2019 will be available NOW, see link " order information " and click on the genus below the page to get price lists at that time. Although a customer can reserve plants in the off season, we only start shipping Peonies end of August and Hardy orchids beginning October. 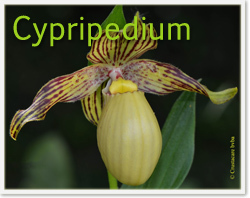 Our mean purpose is supplying a wide range of unusual and rare plants, orchids in particular, for the specialized private collector, botanical gardens, wild orchid gardens and breeding programs for nature support. We do have a few wholesalers as regular customer, but we do not concentrate on producing large numbers of so called easier growing hardy orchids, most hybrids. 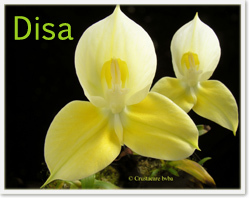 Even when an adult terrestrial orchid sometimes does not depend on partial feeding by one or more funguses, we do beleive that the orchids need fungus connection(s) for resistance against disease, a kind of anti- body. Except our in vitro seedlings, all of our orchids have a fungus attachment. As this takes much more time, our orchids are no subject of a speed up program . On the other hand survival rates for our customers are much better. We will expand our offer with more non orchid botanical treasures such as Peonies, Paris... for the season 2018/2019. Depending on the results of the artificial propagation, the offer will change constantly over time, and the offers will often have limited numbers. For this reason customers can sign in for reservations during the off season via E- mail. This WP is permantly updated. All pictures are Copyright © Crustacare. Any use of it, without permission of the author, will be persecuted by Court.